Definition at line 44 of file itkWatershedSegmentTree.h. Definition at line 71 of file itkWatershedSegmentTree.h. Definition at line 51 of file itkWatershedSegmentTree.h. Definition at line 69 of file itkWatershedSegmentTree.h. 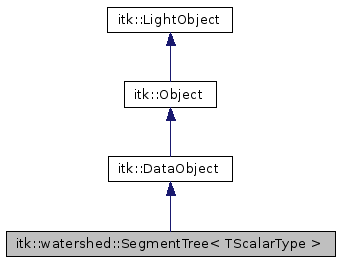 Definition at line 70 of file itkWatershedSegmentTree.h. Definition at line 50 of file itkWatershedSegmentTree.h. Definition at line 53 of file itkWatershedSegmentTree.h. Definition at line 48 of file itkWatershedSegmentTree.h. Definition at line 49 of file itkWatershedSegmentTree.h. Definition at line 72 of file itkWatershedSegmentTree.h. Definition at line 167 of file itkWatershedSegmentTree.h. Definition at line 168 of file itkWatershedSegmentTree.h. Definition at line 169 of file itkWatershedSegmentTree.h. Definition at line 118 of file itkWatershedSegmentTree.h. Returns a const reference to the back of the list (node with the greatest saliency value). Definition at line 110 of file itkWatershedSegmentTree.h. Returns a const iterator pointing to the first element in the list. Definition at line 142 of file itkWatershedSegmentTree.h. Returns an iterator pointing to the first element in the list. Definition at line 138 of file itkWatershedSegmentTree.h. Definition at line 156 of file itkWatershedSegmentTree.h. Returns TRUE if the SegmentTree is empty, FALSE if the SegmentTree is not empty. Definition at line 100 of file itkWatershedSegmentTree.h. Returns a const iterator pointing one element past the last element in the list. Definition at line 152 of file itkWatershedSegmentTree.h. Returns an iterator pointing one element past the last element in the list. Definition at line 147 of file itkWatershedSegmentTree.h. Definition at line 114 of file itkWatershedSegmentTree.h. Returns a const reference to the front of the list (node with the least saliency value). Definition at line 105 of file itkWatershedSegmentTree.h. Standard DataObject routine to initialize. Returns the segment tree to a default state, deallocating memory. Definition at line 170 of file itkWatershedSegmentTree.h. Erases the node at the back of the list. Definition at line 134 of file itkWatershedSegmentTree.h. Erases the node at the front of the list. Definition at line 130 of file itkWatershedSegmentTree.h. Definition at line 126 of file itkWatershedSegmentTree.h. Inserts a node at the front of the list. Definition at line 122 of file itkWatershedSegmentTree.h. Definition at line 95 of file itkWatershedSegmentTree.h. Definition at line 173 of file itkWatershedSegmentTree.h.